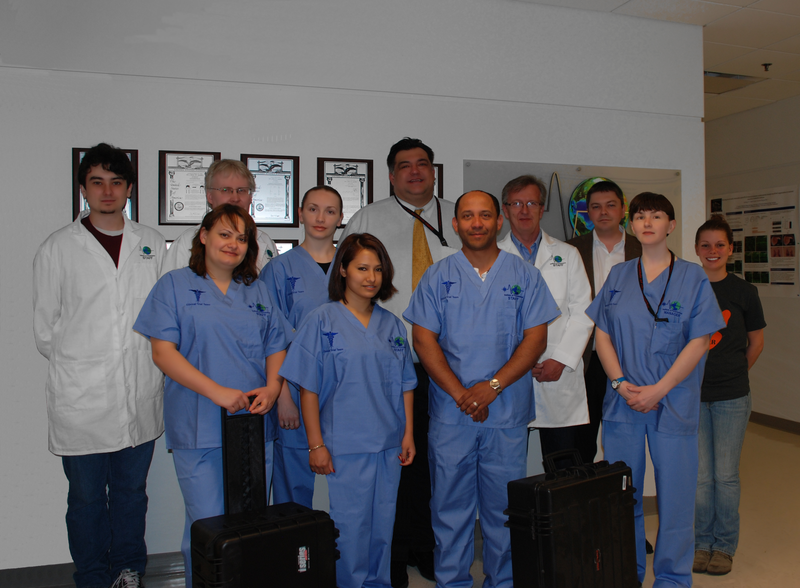 The IoF was founded in 2001 by Dr. Chris D. Geddes, Professor and Director. 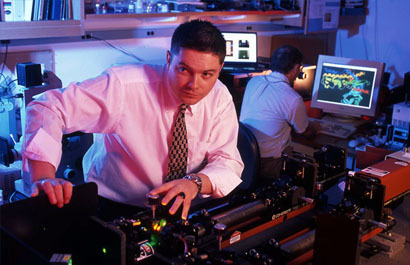 Under the leadership of Dr. Chris D. Geddes, the IoF has earned a well-deserved international reputation for its advances in Fluorescence Spectroscopy and Plasmonics. Approaches and concepts both developed and discovered by the group, such as Metal-Enhanced Fluorescence (MEF), Metal-Enhanced Chemiluminescence (MEC), Surface-Plasmon Coupled Phenomenon and the glucose-sensing contact lens, are both well-recognized, highly cited and currently used in laboratories around the world today. IoF Ph.D. Student Tonya Santaus gives poster at the Biophysical Society meeting, Baltimore, March 4th, 2019. IoF Ph.D. Student Josh Moskowitz gives poster at the Biophysical Society meeting, Baltimore, March 6th, 2019. IoF Ph.D. Student Rachael Knoblauch gives talk at the Annual BioPhysical Society meeting, Baltimore, March 3rd, 2019. Professor Geddes gives the opening Plenary Lecture at Bio-X, Israel, Dead-Sea, March 4th, 2019, Entitled "Plasmonic Generation of Electricity: A Remarkable Plasmon to Current Technology which Promises to Change the Way we Both Think of and Use Fluorescence Spectropscopy Today". Professor Geddes gives a talk at the Bio-X conference in Israel, Dead Sea, March 5th, 2019, entitled "Lyse-It". Professor Geddes gives an invited talk at the Bio-X conference, Israel, March 5th, 2019, entitled "Understanding How Money Thinks!" in the Entrepreneur / Business sessions / lectures at the Conference. Professor Geddes gives invited talk at the Bio-X conference, Israel, March 5th, 2019, entitled "Creating Enterprise Value from within an Academic Setting: Can Professor's be Successful Entrepreneurs?" Professor Geddes' student, Elizabeth Hawkins joins the NASA Space Life Science Training Program. February 2019. Professor Geddes gives interview with the American Society for Biochemistry and Molecular Biology on how Professors can be entrepreneurial from a University setting, September 30th, 2018. IoF's research on Sexually Transmitted Infections (STI's), mentioned in the Baltimore Sun online on Wednesday, September 19th, 2018. 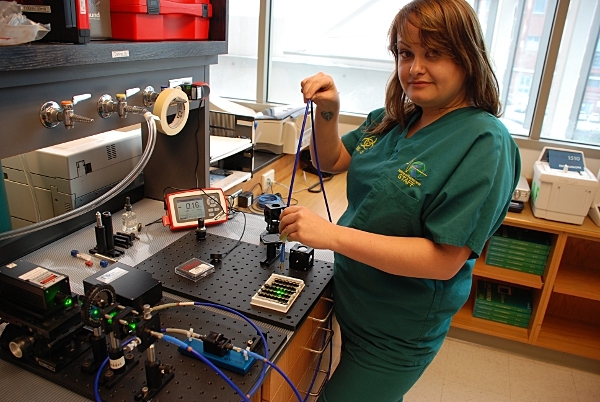 IoF Ph.D. Student Rachael Knoblauch awarded prestigious NSF Graduate Fellowship. Iof has new USE Patent issue entitled "Metal-Enhanced BioLuminescence: An Approach for monitoring Biological Bioluminescent Processes", US Patent No. 10,024,850. August 2018. IoF Ph.D. Student Tonya Santaus gives a poster at the Annual BioPhysical Society meeting in San Francisco, entitled "Viable Pathogenic Organism Transportation and recovery from a Low-Cost Support". Wednesday 22nd February 2018. Professor Geddes'Ph.D. Student, Tonya Santaus, wins a travel award to attend the Annual BioPhysical Society meeting in Baltimore, Feb. 17-21, 2018. Professor Geddes gives an entrepreneurial lecture at the Bio-X conference in Singapore, entitled "Can Professors be entrepreneurs from within an academic setting", February 22nd, 2018. Professor Geddes gives invited talk at Bio-X Singapore, "Plasmonic Generation of electricity: A Plasmon to Current Technology", February 21st, 2018. New IoF Letters Patent Issues, entitled "Ultra-Fest Pathogen Toxin Detection Assay Based on Microwave-Accelerated Metal-Enhanced Fluorescence", Patent No: US 9,816,990, B2. January 9th, 2018. Professor Geddes gives intivited talk at Walter Reed in Washington D.C., entitled "Ultra fast 30 seconds sample preparation and the subsequent Ultra fast identification of bacterial pathogens", January 9th, 2018. New IoF patent issues, entitled "Plasmonic Electricity", US Patent No: 9,810,637. January 2nd, 2018. New IoF patent issues, entitled "Fluorescence Microscope in a Microwave Cavity", U.S. Patent No. 9,784,682, November 15th, 2017. IoF Ph.D. Student, Tonya Santaus, wins first place for the Poster prize at the 6th Annual Conference on Microbiology, Oct. 16-17th, 2017, Baltimore, USA. Now IoF patent issues, entitled "Enhanced Luminescence from Nanopolished Surfaces and Plate-Wells", U.S. Patent No. 9,708,494, October 25th, 2017. Professor Geddes gives invited lecture at the 6th Annual Conference on Microbiology, Baltimore, USA, October 17th, 2017, entitled: "Lyse-It: A technology for ultra rapid and ultra fast cellular lysing and DNA / RNA fragmentation". Professor Geddes gives invited keynote address at Hopkins Mt. Washington Annual retreat, October 19th, "Bringing Entrepreneurship to Science". Professor Geddes gives address at the annual Bio-X conference in Israel, Netanya, June 8th, Entitled "Can Professors be successful entrepreneurs from within an academic setting". Professor Geddes hoods his 2 Ph.D. graduates at UMBC's commencement ceremoney, December 22nd 2016. Pic 1. Pic 2. IoF Ph.D. Student successfully defends her thesis, Congratulations Dr Rachel Schmitz, November 18th, 2016. IoF Ph.D. Student successfully defends his thesis, Congratulations Dr Johan Melendez, November 2nd 2016. New USA Patent Issues: 9,453,797, "Metal-Enhanced Fluorescence from Metallic Nanoburger Structures", October 25th 2016. New Canadian Patent Issued: No: 2,723, 391, "Voltage Gated Metal-Enhanced Fluorescence, Chemiluminescence or Bioluminescence methods and Systems", October 25th 2016. New IoF patent allowed by US patent office, "Multicolor microwave-accelerated Microwave Accelerated Metal-Enhanced Fluorescence, M-MAMEF", No: 14/287,541. September 30th 2016. Professor Geddes wins a TEDCO MII Phase 3 award for Lyse-it LLC, See press release. Professor Geddes signs Patent Licensing deal with the University of Maryland Baltimore County (UMBC), licensing several patent families into the IoFs latest spin out company, Lyse-it LLC, September 22nd 2016. Professor Geddes' eight summer interns present 6 poster presentations at the 19th annual summer undergraduate research fest, i.e. SURF @UMBC, August 10th 2016. Professors' Geddes and Stine receive new award for the development of a Cholera Diagnostic, see press release. Professor Geddes launches new UMBC spin out company, "Lyse-it LLC", Read UMBC press release. IoF has new US Patent granted 14/276,207, entitled "Metal-Enhanced Fluorescence from Metallic Nanoburger Structures", June 23rd, 2016. IoF graduate student, "Tonya Santaus", presents IoF poster entitled "Microwave Cell Lysis and DNA fragmentation of Listeria Monocytogenes" at the American Society of Microbiology annual meeting, Boston, June 17th, 2016. New IoF European Letters Patent granted, No: 2,513,630, entitled "Mixed-Metal Substrates for Metal-Enhanced Fluorescence", June 17th 2016. New IoF US Patent Issues, US Patent No: 9,339, 485, "Plasmonic Engineering of Singlet Oxygen and/or Superoxide Generation", June 9th, 2016. New IoF US Patent Issues, US Patent number: 9,310,303, "Voltage Gated Metal-Enhanced Fluorescence, Chemiluminescence or Bioluminescence methods and Systems", May 23rd 2016. Professor Geddes delivers invited talk on Capital Hill at BARDA (BioMedical Advanced Research and Development Authority), entitled "Microwave-Accelerated Metal-Enhanced Fluorescence (MAMEF): A new and improved technology for the ultra-rapid and sensitive detection of pathogens", April 21st, 2016. Professor Geddes delivers invited talk at Kent State University entitled "Metal-Enhanced Fluorescence: A Paradigm Shift in how we think and use Fluorescence today", April 15th, 2016. New IoF letters patent issues, "Enhanced Luminescence from nanopolished surfaces and plate wells", US Patent No: 9,244,012. March 29th, 2016. IoF Graduate Student "Tonya Santaus", presents poster at the 60th annual BioPhysical Society meeting, "Cell Lysing and DNA fragmentation of Listeria Monocytogenes", March 2nd, 2016. Professor Geddes hosts Journal of Fluorescence editorial board dinner celebrating 25 years of the Journal of Fluorescence, in Los Angeles, Feb 28th, 2016. Our new hard bound book serial "Reviews in Plasmonics 2015" is published, 453 pages, ASIN B01AZ0O8B6. A big thanks to all the contributors of this outstanding volume. Professor Geddes speaks and is quoted in the New York Times on "Aggregation Induced Emission" based molecules. Feb 17th 2016. Professor Geddes celebrates 25 years of the Journal of Fluorescence, as well as discusses the role the Who's who in Fluorescence Annual volume played in the success of the Journal of Fluorescence. Watch Video. Feb 1st 2016. Professor Geddes speaks to 10 years of the Plasmonics Journal, which he founded in 2006. Feb 1st 2016. Watch Video. Professor Geddes' research featured on the front page of the Baltimore Sun, Jan 30th 2016. See Story. 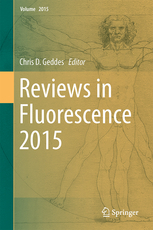 Our new hard bound volume "Reviews in Fluorescence 2015" just published, 380 pages, ISBN: 978-3-319-24607-9. A big thanks to both Springer and the authors for making this an excellent volume, Jan 2016. (Pic). The Journal of Fluorescence, the premier journal for Fluorescence-based peer reviewed research articles in the world today, celebrates its 25th Anniversary in 2016. IoFs 1800 patient clinical trial, very positively reviewed in the Daily Record: http://thedailyrecord.com/tag/chris-d-geddes/ December 28th, 2015. (Pic). New US Patent Issued, "High-Sensitivity Assays for Pathogen Detection using Metal-Enhanced Fluorescence, US Patent No. 9,170,197. December 15th 2015. New European Letters patent issued, "Tuning of Metal-Enhanced Emissions of Long Lived Luminescent Compounds", No: 2569394, December 11th 2015. Professor Geddes speaks to New York Times writer on "New aggregation-based fluorescent material / molecules", December 8th 2015. 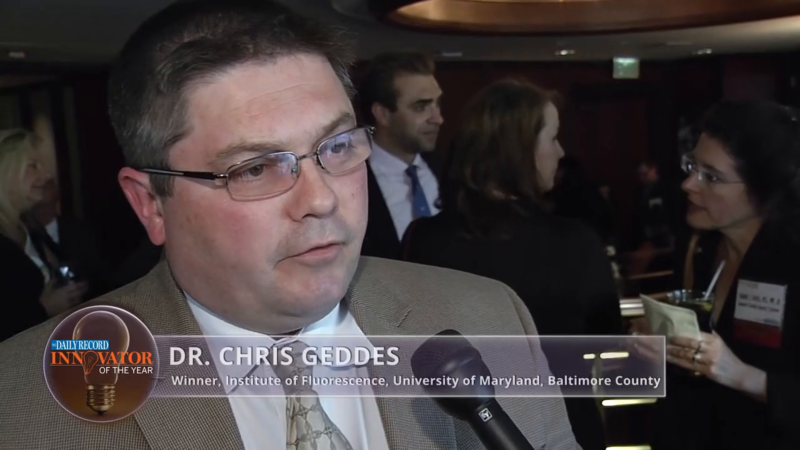 Professor Geddes awarded for technology innovation at UMBC's innovators luncheon. 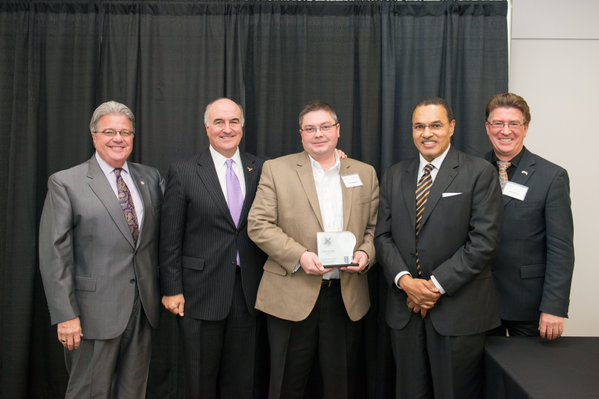 Award presented by President Hrabowski, Chancellor Bob Caret, Mike Gill, Maryland commerce secretary and Dr Karl Steiner, UMBC VP for research. Dec. 3rd 2015. Pic. US Patent Issued: "Bioassays using plasmonic scattering from noble metal nanostructures", US Patent # 13/355,794. November 19th 2015. Renowned Plasmonics theoretician "Peter Norlander", from Rice University visits IoF, September 9th 2015. Professor Geddes speaks to the Daily Record at the Innovator of the Year award Ceremony. See video at Professor Geddes' u-tube channel. 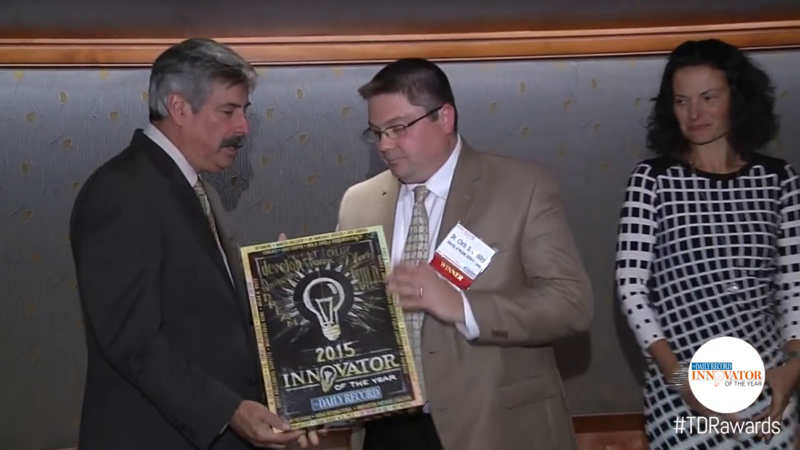 Professor Geddes receives innovator of the year award at Baltimore's downtown center club, Oct 15th 2015, Pic 1, Pic 2. 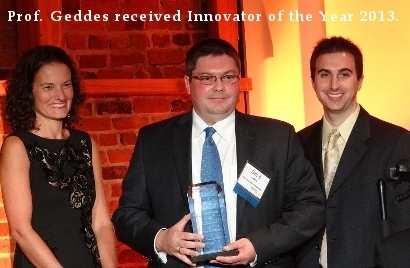 Professor Geddes and the IoF named Maryland "Innovators of the Year 2015", August 26th 2015. Award Ceremony on Oct 15th. 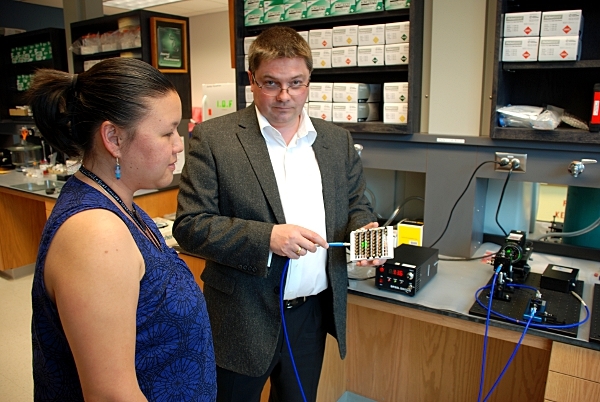 Professor Geddes is awarded a new NIH grant to undertake a 1800 patient clinical trial using his MAMEF technology for the detection / determination of STDs. IoF book chapter published in Viral Diagnostics, Pan Stanford, pgs 201-220, August 2015. "Pathogen detection using spatially focused microwaves and MEF". IoFs Rachel Taylor presents poster at the ACS meeting, "Determination of structural properties of fluorescent methane carbon nanodots", ACS meeting, Boston, Aug 16-20th, 2015. IoF graduate students and interns present 3 posters at UMBCs SURF conference, August 5th 2015. New US Patent Issues, No: 9,075,018, "Microwave triggered metal-enhanced chemiluminescence and spatial and temporal control of the same", August 2015. Professor Geddes gives closing lecture at Bio-X, Israel, June 1st 2015. "Lyse-it - An Ultra Rapid and Cost Effective Cellular Lysing Platform"
Professor Geddes gives opening international address at Bio-X conference,Israel, May 28th 2015. "Metal-Enhanced Fluorescence". European Patent granted, No: 06717254.4-1225, "Microwave-Accelerated Plasmonics". Japanese Patent granted, No. 2012-543339, "Plasmonic Electricity". A new US Patent granted, No: 12/016,247, "Metal-Enhanced Fluorescence nanoparticles". Looking for Fluorescence / Plasmonics Consultation: See http://fluorescencemadeeasy.com (We Make Fluorescence Easy). IoF Patent Issues: "Nanostructures for polarized imaging and receptor / ligand quantization: Breaking the diffraction limit for imaging", U.S. Patent No, 8,987,004. April 8th 2015. A new commentary on our recent PNAS paper has just been published in PNAS. Professors Hill and Geddes address Darwins Paradox in a new high profile PNAS paper. Professor Geddes chairs the NIH (National Institutes of Health) pediatric small business review meeting, ZRG1-SBIB-V(55), and SBIB-F(06), March 12th 2015. Professor Geddes hosts a Journal of Fluorescence editorial board dinner at the Annual Biophysical Society meeting, Feb 8th 2015 - A Strategic Planning session for the Journals' 25th year anniversary next year. Professors Hill and Geddes have an important paper accepted in PNAS - Proceedings of the National Academy of Sciences of the United States of America, which significantly contributes to our understanding of nutrients in coral reef environments. Feb 4th 2015. Professor Geddes presents invited talk "Metal-Enhanced Fluorescence", at BASF, Wyandotte, USA, January 13th, 2015. IoF develops 5 color Multiplexed MAMEF assay. January 2015. IoF Letters Patent Issues, "Sonicated-Assisted Metal-Enhanced Fluorescence (SAMEF)-based Bioassays", US Patent 8,906,701, December 9th 2014. New IoF patent issues, "Angular-Dependent Metal-Enhanced Fluorescence", US Patent 11/750,119, December 18th, 2014. New IoF Patent issues, "Microwave Acclerated Plasmonics", US Patent No. 8,886,464, November 11th 2014. IoF Letters Patent Issues, “Conversion of Just-Continuous Metallic Films To Large Particulate Substrates For Metal-Enhanced Fluorescence”, US Patent 8,822,228, September 2nd 2014. IoF Letters Patent Issues, “Plasmonic Electricity”, Canadian Patent No: 2,739,309, August 26th 2014. IoFs peer-reviewed Springer Journal "Plasmonics", increases in Impact Factor from 2.425 (2012) to 2.738 in 2013. Daniel Kiang, IoF undergraduate intern presents poster at UMBC’s undergraduate conference, SURF, August 6th 2014. 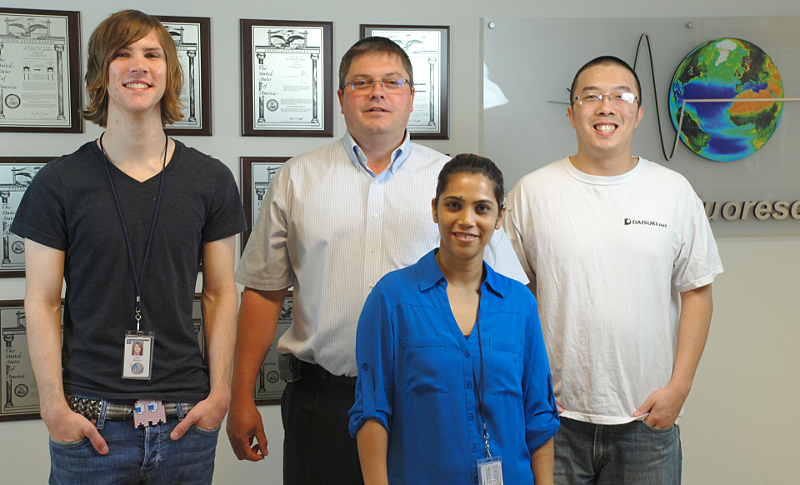 Tonya Santus and Birsen Varisli rotate in the IoFs / Chem Depts Graduate Student program for the summer 2014. Pic1, Pic 2. IoF Letters Patent Issues, “Metal-Enhanced Fluorescence Based Sensing Methods”, US Patent No: 8,759, 110, June 24th 2014. IoF Presents Poster “Ultra Rapid and Sensitive Detection of Neisseria gonorrhoeae and Antimicrobial Resistance Susceptibility at the Center of Disease Control (CDC) STD Prevention Conference”. Atlanta, GA. June 9 – 12, 2014. IoF patent Issues: “Multicolor Microwave Accelerated Metal-Enhanced Fluorescence (M-MAMEF), May 27th 2014, Patent No: 8,735, 175. IoF presents “Detection of Chlamydia and Gonorrhea by Microwave-Accelerated Metal-Enhanced Fluorescence” at the CFTCC Symposium. Boston Univeristy. May 20, 2014. IoF Letters Patent Issues, “Metal-Enhanced Fluorescence from Metallic Nanoburger Structures”, US Patent No. 8,722,428, May13th 2014. 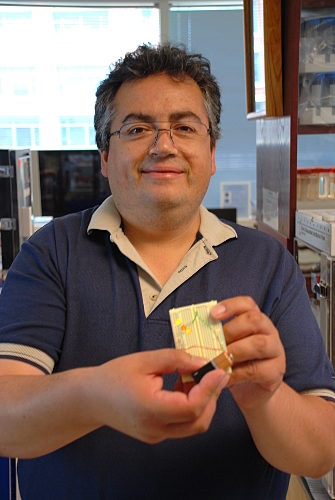 IoFs Johan Melendez presents “Development of a Microwave-Accelerated Metal-Enhanced Fluorescence Assay for the Detection of Neisseria gonorrhea” at the Seventh Annual Frontiers at the Chemistry-Biology Interphase Symposium, University of Maryland Baltimore. May 10, 2014. Professor Paul Weiss, Editor-in-chief of ACS Nano, visits the IoF, May 6th 2014. Professor Geddes invited and accepts to join the Editorial Board of Frontiers in Analytical Chemistry, March 29th 2014. Professor Geddes presents invited talk "Metal-Enhanced Fluorescence: Theory and Diagnostic Applications" at Du Pont, Wilmington, DE, March 27th 2014. New IoF Patent Issues: "Metal-Enhanced Fluorescence based Sensing Methods", US Patent No: 13/164,146, February 21st 2014. IoF Faculty, Staff and Students present several posters at the Annual BioPhysical Society Meeting, San Francisco, CA, USA, February 15-19th 2014. New IoF Patent issues: "Microwave-Accelerated Assays", US Patent No: 13/686,031, February 4th 2014. New IoF Patent issues: "Voltage Gated Metal-Enhanced Fluorescence, chemiluminescence or Bioluminescence methods and systems", US patent No: 12/920,937. February 3rd 2014. New IoF Patent issues: "Plasmonic Electricity", Canadian Patent No: 2,739,309, January 16th 2014. New IoF Patent issues: "Plasmonic Electricity", US Patent No: 8,618,505 B2. December 31 st 2013. Professor Chris D. Geddes gives an invited talk at the Chemistry Department, Portland State University, December 16th 2013. Title: "Metal-Enhanced Fluorescence". Dr Chris D. Geddes presents "Metal-Enhanced Fluorescence: A look back on the last 10 years" at the NIHs Mid Atlantic Meeting for the Regional Centers of Excellence, December 10th 2013. Dr Chris D. Geddes chairs NIH (National Institutes of Health) Study Section, "Safe and Effective Instruments and Devices for use in Neonatal and Pediatric Care Settings", December 3rd 2013. Professor Geddes joins the editorial board of the Journal of Photochemistry, Nov 20th 2013. IoFs research featured on the front cover of PCCP (Physical Chemistry Chemical Physics); 15,(45), Nov 2013. Maryland Comptroller Peter Franchot, congratulates IoF on its Innovator of the Year 2013 award. See letter. September 5th 2013. Professor Geddes comments in Delegate Jon Cardin's Maryland Attorney General video, See video. Professor Geddes and IoF announced winners of the 2013 Innovator of the Year Award for their clinically validated STD platform - Details to follow the Oct 2nd award ceremony. 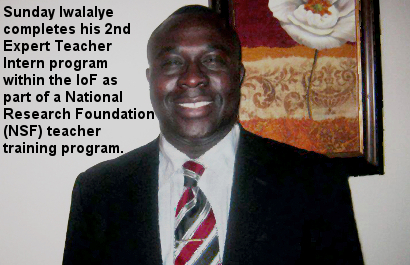 This is the 3rd time Professor Geddes and the IoF have received the award in 6 years, August 23rd 2013. IoF publishes its Clinically Validated MAMEF STD test in J. Clinical Microbiology, see pdf. August 20th 2013. New IoF Letters Patent issues: 'Metal-Enhanced Chemiluminescence (MEC)", Canadian Patent No: 2,642,280, August 16th 2013. New IoF Letters Patent Issues: "Metal-Enhanced Fluorescence from Plastic Substrates", Canadian Patent No: 2,628,056, August 1st 2013. Professor Geddes presents invited lecture at Dow Chemicals, Midland, MI, "Metal-Enhanced Fluorescence: Progress towards a Unified Plasmon Fluorophore Description", May 7th 2013. New IoF Patent Issues: "Fluorescence Microscope in a Microwave Cavity", US Patent 8404450, March 26th 2013. Professor Chris D. Geddes becomes FRSC, Fellow of the Royal Society of Chemistry, March 18th 2013. (FRSC - read more). Professor Geddes presents invited lecture "Metal-Enhanced Fluorescence: Progress towards a Unified Plasmon Fluorophore Description" at Drexel Univeristy, Philadelphia, March 14th, 2013. abstract. IoF successfully completes Clinical Validation of its ultra-rapid and sensitive STD test, March 4th 2013, read more. Professor Geddes presents both opening and closing International Plenary Lectures at NanoSensorPhotonics, Eilat, Israel, Feb 10th 2013. Opening: “Metal-Enhanced Fluorescence, Theory and Applications”; Closing: “Microwave-Accelerated Metal-Enhanced Fluorescence”. Dr Jan Karolin presents “Excitation Volumetric Effect of Plasmon-Enhanced Singlet Oxygen and Superoxide Generation”, at the annual Biophysical Society meeting, Philadelphia, February 4th 2013. Professor Geddes joins the International Steering committee of "NanoSensorPhotonics", an annual International Plasmonics Conference. Professor Geddes presents "Metal-Enhanced Fluorescence: Progress towards a Unified Plasmon-Fluorophore Description" at Nanyang Technological University, Singapore, Jan 17th 2013. Professor Geddes presents "Multiplexed Pathogen detection" at the NIH's Mid Atlantic Regional Centers for execellence for Biodefense and emerging infectious diseases annual meeting, Airlee House, VA, USA, Dec 18th 2012. Professor Geddes presents invited talk at Porton Down, "Metal-Enhanced Fluorescence: Ultra-fast and Ultra Sensitive Multiplexed Pathogen Detection", Porton Down, DSTL, Wiltshire, UK, Dec 13th 2012. New IoF patent granted, "Fluorescence Microscope in a Microwave Cavity", US Patent 12,602, 552, Dec 7th 2012. New IoF patent Issued, "Microwave Accelerated Assays", US Patent, 8, 318, 087 B2. Nov 27th 2012. New IoF patent granted: Metal-Enhanced Chemiluminescence (MEC), Canadian Patent 2,642, 280, Nov 7th 2012. IoF hiring new Research Associate (Post Doc) in Fluorescence Spectroscopy and Plasmonics - More Info, Nov 1st 2012. IoFs research on Metal-Enhanced Fluorescence (MEF) theory and applications is featured on the front cover of the Journal of Fluorescence, Vol 22, issue 5, 2012. October 13th 2012. New IoF patent granted, "Quaternary Nitrogen heterocyclic compounds for detecting aqueous monosaccharides in physiological fluids", US Patent, 12/781, 899. August 25th 2012. IoFs research on SYBER Green DNA interactions is featured on the front cover of the Journal of Fluorescence, Vol 22, issue 5, 2012. August 20th 2012. 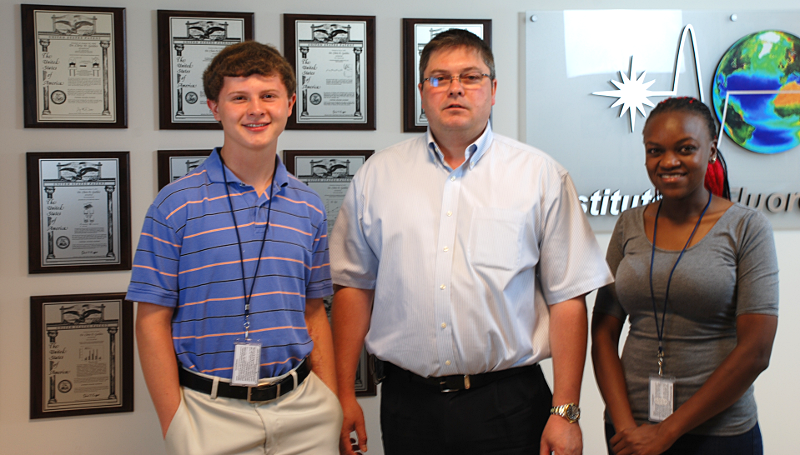 Another highly sucessful IoF summer student internship concludes, June - August 24th 2012. Pic. 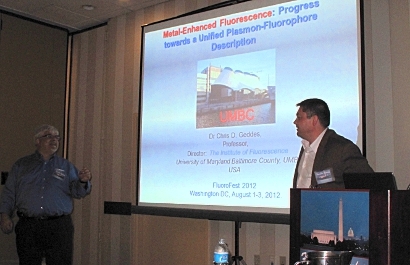 Professor Geddes presents invited talk at Fluorofest 2012, "Metal-Enhanced Fluorescence: Progress towards a Unified Plasmon Fluorophore Description", Bethesda, Wasington DC, August 1-3, 2012. Pic. New IoF Patent Issues, "Metal-Enhanced Fluorescence from Plastic Substrates", US Patent, 8, 182, 878 B2, (Issue date 5-22-12), July 10th 2012. IoFs "Journal of Fluorescence" Impact Factor rises to 2.107, highest value in several years. IoFs Plasmonics Journal Impact Factor at 2.989. July 2nd 2012. IoFs Ultra Fast and Sensitive Assay Platform for STDs, CT and GC, presented at the NIH / NIBIB point of Care Technologies Research Network, June 12th 2012. Professor Chris D. Geddes presents an Invited talk at the ACS MARM meeting, "Metal-Enhanced Fluorescence: Progress towards a Unified Plasmon Fluorophore Description", UMBC, Baltimore, June 2nd 2012. Professor Geddes and Dr Karolin Co-chair the Nanochemistry B session at the ACS MARM Meeting, UMBC, Baltimore, June 2nd 2012. Professor Chris D. Geddes presents an Invited talk at E-MRS, "Metal-Enhanced Fluorescence: Progress towards a Unified Plasmon Fluorophore Description", Strasbourg, France, May 16th 2012. Dr Jan Karolin presents Poster "Metal-Enhanced Fluorescence: Progress towards a Unified Plasmon Fluorophore Description", E-MRS, Strasbourg, France, May 14th 2012. Horiba President Steve Slutter, VP Sal Atzeni and Director of Fluorescence Division Ishai Nir visit IoF, May 8th 2012. Pic. Sir Peter Knight, FRS, invites IoF Director, Professor Geddes, to become a "Fellow" of the Institute of Physics, London. April 23rd 2012. Nobel Laureate Dr Martin Chalfie (Chemistry - GFP 2008) meets IoF Faculty and Staff. Pic 1, Pic 2, Pic 3. Professor's Geddes and Chalfie discuss MEF theory, Pic 4. April 18th 2012. IoF and US Navy develop highly sensitive and rapid Anthrax toxin assay, March 31st 2012. - Read More. Bill and Melinda Gates Foundation fund the IoF to undertake a Human clinical trial in Karachi, Pakistan, August through December 2012. More Information. IoF to undertake a human clinical trial for the detection efficacy of non-typhoidal Salmonella in a vaccine challenge trial using the IoFs Metal-Enhanced Fluorescence technology at the University of Oxford, UK, May through July 2012. New IoF patent Issues "High-Sensitivity assays for Pathogen detection using Metal-Enhanced Fluorescence", United States Patent, US 8,114, 598 B2, Feb 14th 2012. Dr Jan O. Karolin joins the IoF as a new faculty member, Feb. 1st 2012. New IoF patent issues "Bioassays using Plasmonic Scattering from Noble Metal Nanostructures", US Patent No: 8, 101, 424 B2, Jan 24th 2012. Tom Frechette Joins the IoF as the new IoF Financial Buisiness Manager, Jan 17th 2012. New IoF Patent Issues "Nanostructures for Polarized Imaging and Receptor/ligand Quantization: Breaking the Diffraction Limit for Imaging", Canadian Patent No: 2, 659, 640, Jan 14th 2012. New IoF Patent Issues "Metal-Enhanced Fluorescence from Plastic Substrates", US Patent 8,075,956, Jan 1st 2012. IoF Annual Christmas party, Dec 22nd, 2011. Drs Dragan and Geddes awarded the IoFs annual paper award for their new theoretical description of "Metal-Enhanced Fluorescence Excitation Volumetric Effects, MEF-EVE". IoF annual holiday food drive donates 274 pounds (by weight) of food to the Maryland Food Bank, December 22nd, 2011. Professor Geddes presents "Multiplexed Ultra Fast and Sensitive Bioagent Assays", at the Mid-Atlantic Regional Center of Excellence for Bioagents and emerging infectious diseases (MARCE) regional meeting, Airle, VA, December 20th, 2011. New IoF patent Issues, "Cyanide Sensing Compounds and Uses Thereof", European Patent No: 1671118, Dec 17th, 2011. IoF celebrates 10 years of leading edge and collaborative research. A message of thanks from the Director. November 18th 2011. New IoF patent issues, "Microwave-Accelerated Assays", US 8, 034, 633 B2. Issue date 10-11-11. 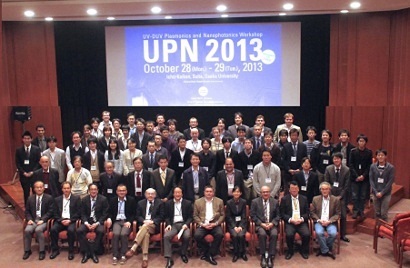 Professor Geddes joins the editorial board of "Recent Patents in Materials Science", Bentham Science, Nov. 2011. Professor Geddes presents ""Metal-Enhanced Fluorescence: Progress towards a Unified Plasmon-Fluorophore Description" at Penn State, November 16th 2011. Professor Geddes gives the Opening Plenary Lecture at NanoSensorPhotonics, Israel, 6th November 2011, "Metal-Enhanced Fluorescence: Progress towards a Unified Plasmon-Fluorophore Description"- Abstract. IoF is expanding further and hiring a Financial Business Manager, October 9th 2011. IoF @ UMBC Fall Semester, Graduate (Ph.D.) Level, 3 credit “Fluorescence Spectroscopy Course” now underway. See Syllabus. IoF launches new Hard Bound Book Serial: Reviews in Plasmonics. 1st Volume released Nov 30th 2011. ISBN: 978-1-4614-0883-3. IoF publishes new volume: Reviews in Fluorescence 2010, 7th volume in the series. ISBN: 978-1-4419-9827-9, released: Oct 31st 2011. New IoF Patent issues: "Microwave Triggered Metal-Enhanced Chemiluminescence (MT-MEC) and Spatial and Temporal Control of the same", August 30th 2011, US Patent No: 8, 008, 067. IoF publishes new Book: Annual Reviews in Fluorescence 2009, ISBN 978-1-4419-9671-8, August 5th 2011. Professor Geddes receives 5-year NIH service award (2007-2011) from the Enabling Bioanalytical and Imaging Technology Study Section, EBIT, June 28th 2011. Professor Geddes presents "A Multi-Analyte and Flexible Platform Technology - Microwave-Accelerated Metal-Enhanced Fluorescence (MAMEF)", at the NIH, NIAID/NIBIB SMMart Bioworkers workshop, NIH, Bethesda, MD, June 27th 2011. IoF Presents a poster "Rapid Approach for Lysis of Microbial Pathogens" at the NIH NIBIB 2011 POCTRN International Symposium, US Davis Medical Center, Sacramento, CA, June 24th, 2011. IoFs Johan Melendez presents "Development of a Microwave-Accelerated Metal-Enhanced Fluorescence (MAMEF) as a point of care assay for the detection of Neisseria Gonorrhoeae", at the NIH NIBIB 2011 POCTRN International Symposium for commercialization, US Davis Medical Center, Sacramento, CA, June 24th, 2011. Professor Geddes presents "Multiplexed Ultra Fast and Sensitive Bioagent and Clinical Assays" at the NIH's NIBIB POCTRN meeting, UC Davis, Sacramento, CA, June 23rd 2011. Professor Geddes prresents "Multiplexed Ultrafast and Sensitive Bioagent Assays", at the Mid-Atlantic Regional Center of Excellence for Bioagents and Emerging infectious Diseases annual conference, Mt Washington, Johns Hopkins University, Baltimore, June 14th, 2011. New IoF Patent Issues, "Metal-Enhanced Fluorescence-based sensing methods", May 10th 2011, US Patent: 11, 917, 804. IoF is Hiring 2 new Postdoctoral fellows, May 8th 2011. 1) Fluorescence Spectroscopy, 2) Metal-Enhanced Fluorescence. IoFs Mixed-Metal Metal-Enhanced Fluorescence research featured on the FRONT COVER of JMC, Journal of Material Chemistry, May 7th 2011. IoF and Colleagues develop an Ultra Fast and Sensitive Salmonella Test, detecting 1 cfu/ml in 20 seconds. April 8th 2011. 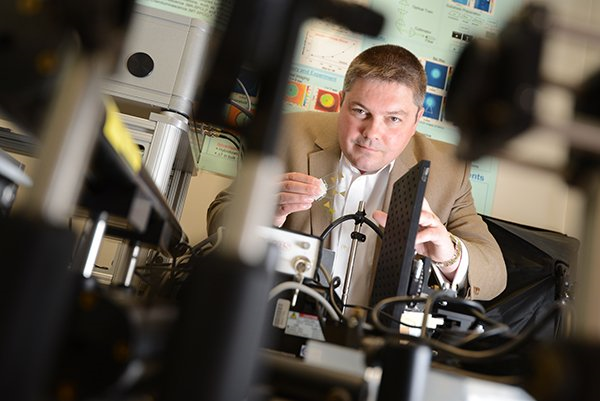 Professor Geddes discusses the IoFs high-tech quest for green energy in the Catonsville Times. April 6th 2011. Professor Geddes presents "Micorwave-Accelerated Metal-Enhanced Fluorescence (MAMEF) based ultra fast and Ultra Sensitive Multiplexed Pathogen detection" at the National NIH RCE meeting, Denver, Co, April 5th 2011. Professor Geddes presents "Ultra Fast Diagnostics for Emergency room settings", National Institute of Health, NIH, NIBIB, Bethesda, MD, 3-23-2011. IoF and Professor Geddes honored by Maryland House of Delegates in Annapolis, House Resolution #326, for outstanding contributions to education, biotechnology and innovation, 16th March 2011. IoF and Chemistry Dept., UMBC, co-host Professor Steve Blair's seminar "Fluorescence Enhancement and Photochemistry with Plasmonic Nanostructures", March 15th, 2011. Professor Steve Blair, University of Utah, visits the IoF, 14th March 2011. IoF and Springer host Journal of Fluorescence annual Editorial Board Dinner, March 7th 2011. Horiba Visits IoF, March 7th, 2011. Professor Michael Johnson, University of Virginia, Visits the IoF, March 7th 2011. IoFs Johan Melendez is awarded a Meyerhoff Graduate Fellowship,which is designed to increase the number of minority students who receive their Ph.D in the biomedical field. Feb 25th 2011. 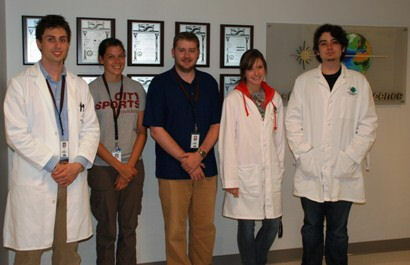 Professor Chris D. Geddes attends NIH Study-Section ZRG1 BCMB-M (90): Special Topics in Chemistry, Feb 23-24, 2011. IoF postulates Excitation Volumetric Effects (EVE) in Metal-Enhanced Fluorescence (MEF EVE). February 18th 2011. IoF and Chemistry Dept., UMBC co-host Professor Strongin's seminar "The design of new organic fluorophore architectures and their application to disease diagnostics". Feb 1st 2011. Professor Robert Strongin from Chemistry Dept., Portland State University, USA, visits IoF, Jan 31st 2011. IoF developes an Ultra Fast and Ultra Sensitive Salmonella test using the IoFs Microwave-Accelerated Metal-Enhanced Fluorescence (MAMEF) technology. The assay can detect 1 cfu/ml salmonella in 20 seconds. Video January 10th 2011. Professor Geddes delivers "State of the IoF" address at the IoF annual Christmas dinner, December 22nd, 2010. IoF food drive donates 210 pounds of food to the Maryland Food Bank, December 22nd, 2010. Delegate Jon Cardin visits the IoF, December 21st 2010. Professor Geddes presents "Metal-Enhanced Fluorescence: A paradigm Shift in the way we both think and use Fluorescence Spectroscopy today", Physics Department, UMBC, November 10th, 2010. Professor Geddes presents "Metal-Enhanced Fluorescence: A paradigm Shift in the way we both think and use Fluorescence Spectroscopy today" invited seminar, Chemistry Department, Iowa State University, Ames, Iowa, October 22nd, 2010. IoF receives "Innovator of the Year Award", October 21st, 2010. Professor Geddes presents "Metal-Enhanced Fluorescence: A paradigm Shift in the way we both think and use Fluorescence Spectroscopy today", Invited seminar, Johns Hopkins University, Homewood Campus, Baltimore, October 14th, 2010. IoF Presents poster "Metal-enhanced Fluorescence based detection of Bisphenol A", Shenna A Young and Chris D. Geddes, 36th International Symposium on Evironmental Analytical Chemistry, Rome, Italy, October 5-9th, 2010. IoF featured in UMBCs Retriever weekly. (web version, full article), September 21 st 2010. Professor Geddes and IoF named Innovators of the Year 2010, August 20th 2010. Professor Geddes chairs NIH study section, ZRG1 BCMB-M 90 Special Topics in Chemistry, August 3-4 th, 2010. IoF and other former UMBI centers strategically align with other USM campuses, July 1st 2010. IoF transfers within the University of Maryland System from UMBI to UMBC, June 21 st 2010. Patent Issued to IoF, US Patent No: 7,732, 215 B2, "Cyanide sensing compounds and uses thereof", issued June 8th 2010. Professor Geddes presents "Multiplexed Ultrafast and Sensitive Bioagent assays" at the NIH's MARCE Biofence meeting, Turf Valley resort, Maryland, June 2nd, 2010. IoF publishes new book on Metal-Enhanced Fluorescence, May 20th 2010. Patent Issued to IoF, US Patent No: 7,718,804 B2, "Quaternary Nitrogen heterocyclic compounds for detecting aqueous monosaccharides in physiological fluids", issued May 18th 2010. Delegate Jon Cardin tours the IoF to learn how Metal-Enhanced Fluorescence from plastics could help with Energy Costs in Maryland, May 17th 2010. Professor Geddes delivers Plenary Lecture at MedImmune's Annual Conference, Gaithersburg, MD, "Application of Microwaves to fluorescence in the development of a high sensitivity residual DNA assay", May 6th, 2010. Professor Geddes presents "Metal-Enhanced Fluorescence based ultra fast and ultrasensitive multiplexed pathogen sensing" at the 6th annual NIH National Regional centers for Excellence for Biodefense and emerging infectious diseases meeting, Las Vegas, USA, April 13th, 2010. Professor Geddes speaks at the WCBP CMC stratedgy forum and FDA Panel, "Advanced Fluorescence methodologies for Protein detection, quantification and structural determination", Washington DC, USA, Jan 24th, 2010. IoF publishes hardbound volume "Annual Reviews in Fluorescence 2008", Jan 2nd 2010. US Senator Ben Cardin and Delegate Jon Cardin attend IoF annual Christmas dinner, Dec 22nd 2009. Santaus, T.M., Shan, Li, Ladd, P., Harvey, A., Cole, S., Stine, O.C., and Geddes C.D. (2018). Rapid sample preparation with Lyse-It® for Listeria monocytogenes and Vibrio cholerae. PLOS ONE, 13(7), e0201070. Zhang, F., Blasiak, L.C., Karolin, J.O., Powell, R. J., Geddes, C. D., Hill, R.T. (2015). Phosphorus Sequestration in the form of Polyphosphate by Microbial Symbionts in Marine Sponges. PNAS - Proceedings of the National Academy of Sciences of the United States of America, 112(14),4381-4386. Melendez et al, (2013). Blind Evaluation of the Microwave-Accelerated Metal-Enhanced Fluorescence Ultrarapid and Sensitive Chlamydia Trachomatis test by use of Clinical Samples, Journal of Clinical Microbiology, 51(9), 2913-2920. 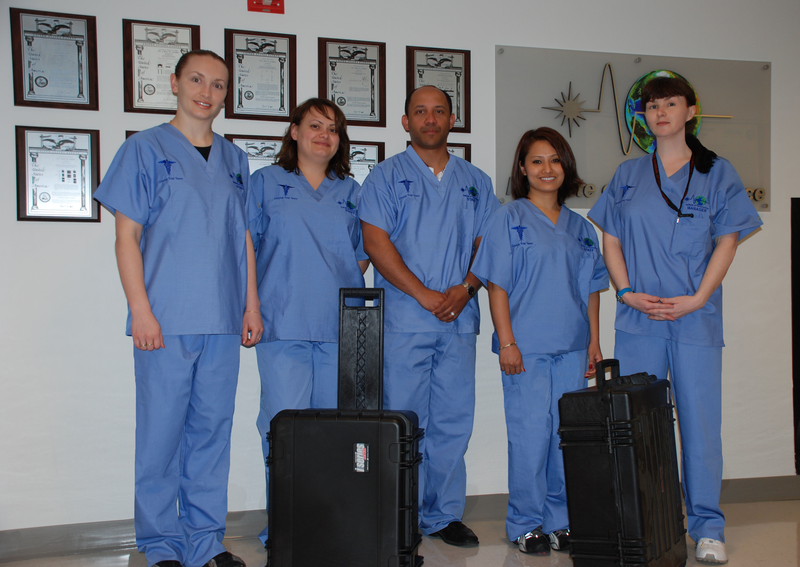 Meet the IoF Clinical Trial Team whom will perform boots-on-the-ground clinical measurements, Pic, (left to right), Evgenia, Rada, Johan, Buddha and Caroleann. April 28th 2012. IoF goes mobile and develops portable MAMEF detection optics, capable of fitting within small cases for its foreign clinical testing sites. Pic. April 28th 2012. Dr Sharon Tennant, co-investigator, visits IoF in preparation for the clinical trials. Pic. 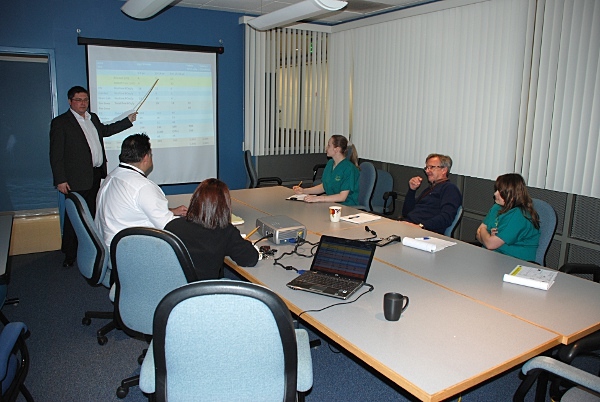 Delegate Jon Cardin Visits IoF to discuss IoFs forthcoming international clincial testing, April12th 2012. IoF faculty and staff discuss the significant logistical challenges of undertaking 2 clincial trials in foreign locations as well as patient numbers and equipment needed. Approximately, 15,000 clinical whole-blood samles will be studied in Pakistan from August - Dec 2012. Pic. Learn more about the IoFs Microwave-Accelerated Metal-Enhanced Fluorescence Salmonella detection technology from Professor Geddes and his staff, shot from the IoFs BSL-3 (BioSafety Level 3) facility. Video. IoFs Ultrafast Assay Salmonella assay can detect 1 single Salmonella bacteria, pdf.